Light is critical to our painting. Without it our subject is lost. On my recent trip to the Lake District I experienced many exciting ‘light moments’, often simply gazing at the light in wonder at the sheer beauty, then snapping out of my mesmeric state to quickly record the moment. Just watching, and observing, though will tell you a lot about how light and shadow affect what we see and paint. In the mountains these effects are often accentuated by the numerous folds in the mountainsides and the inter-relationships of peaks and ridges, which can seem to change continually in windy, broken-cloud conditions. If you take a series of photographs of these ever-changing moments it can be quite revealing how the emphasis changes. This view of Upper Loch Torridon is just part of a composition. While on the spot I sketched it once and photographed it several times while the light and shadows on the mountain were changing. This method of working extends your options for the finished painting considerably. Note where the hard and soft edges to the shadows appear, and how certain crags are highlighted at times, thus providing a potential centre of interest. On distant peaks I prefer to suggest detail rather than make it stand out too strongly. I shall also be giving a demonstration of painting a highland scene in the nearby Pitlochry Festival Theatre at 2pm on Wednesday 23rd April. 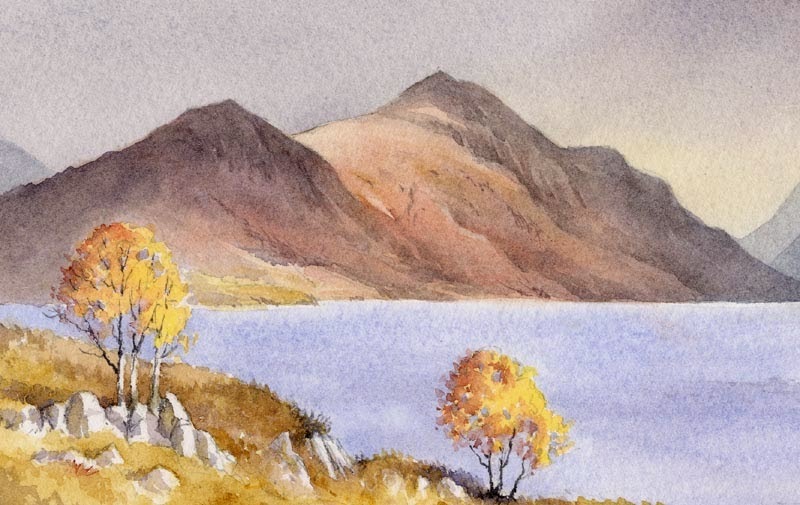 This entry was posted in atmosphere, David Bellamy, watercolour demonstration by David Bellamy. Bookmark the permalink. Many thanks for this, I am looking forward to attending the demonstration at Pitlochry on the 23rd.April. Trust that this is the first of many such master classes.